Bose amplifiers are commonly seen in shop in need of repair for no/low sound, snapping, popping and/or squealing. Please see our link to Shipping top and bottom of all pages before sending for repair. 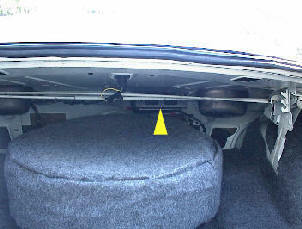 1) Bose amplifier is located in trunk, it is bolted to the bottom of the package shelf with four 10mm bolts. Remove bolts, disconnect connectors and remove.